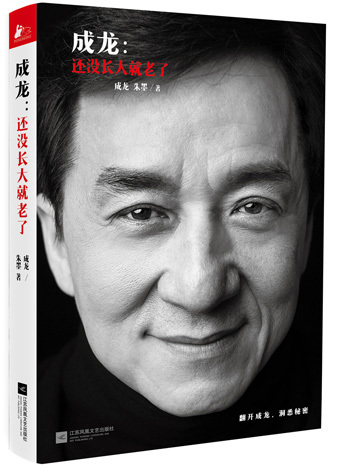 Kind of strange reviewing a Chinese book on an English site but here goes, a brief review of Jackie Chan’s latest autobiography, “成龙：还没长大就老了”, loosely translated as “Never Grow Up, Only Get Older”. Written by one of Chan’s close friends, Zhu Mo (a former marketing staff at Huayi Brothers), the book is an insightful read into the life of the action star. To a certain extent, it certainly included more personal thoughts, messages than his official 1998 autobiography “I Am Jackie Chan: My Life In Action”. With the action star turning 61 years old this year, Zhu took an intimate look on his current stance on fame, fortune and family. The book devoted several chapters on Jackie’s growing up years in the home of the French embassy where his dad and mum worked. Being born poor propels Chan to find ways to fork out a living in the movie industry after leaving opera school. And Chan did admit he became arrogant and cocky once he start receiving big paychecks after a string of flops. As age catches up, the action star becomes more reflective on his past ways and he readily offers apologies for all his past wicked deeds. Even though he readily shared details about his unusual friendships with hostess and a romance with the late songstress Teresa Teng in his younger days, those waiting for his juicy revelation about his scandalous affair with Elaine Ng will be sorely disappointed. While he admitted to the mistake and asking forgiveness from his wife, he made no further mention about Ng or his biological daughter. On the other hand, he is much open and generous when it comes to describing his relationship with his son, Jaycee Chan. Sharing interesting anecdotes and events of the son he hardly met when the former was growing up and declaring his love to the woman who tolerated the action star’s fiery temper and often absentee from the household – Taiwanese starlet Lin Fengjiao. Those however who are not accustomed to Chan’s preachy manners might find this book quite a bored read as many of his thoughts and messages can be gratingly repetitive. The best (and entertaining) aspects of this book are when Chan discussed about the making of his classic movies. Liked how he came about doing that death-defying fall in Project A, the sliding down stunt in Police Story and why he tribute the stunt in Who Am I? to his opera master. In addition a funny story of how Yuen Biao and him went after a pickpocket while on the set of Wheels on Meals and his near-death experience working on Armour of God. Not forgetting his inheritance of the supposed haunted rest area of Bruce Lee. Unfortunately, these little-known anecdotes are few and far and I’m sure he has truckloads to share with his fans that grew up loving his action style and movies. While the book acknowledges those he is heavily indebted to, his family and his godfather, one of Golden Harvest’s founders, Leonard Ho, the book mentioned too little about his co-stars and friends with only skimpy pages dedicated to the late Leslie Cheung and frequent co-star Anita Mui. Even though Zhu Mo tried her best to reveal unknown details about the much maligned action star (who by the way is extremely generous to all his staff and strangers), you can’t help but feel that the duo needs more time to come up with a much better read. Jackie Chan certainly can tell wondrous stories but “Never Grow Up, Only Get Older” comes across more as a personal note and companion read to his earlier autobiography. For fans who love the international star for his movies rather than his gossipy personal life might want to give this a miss. All other logo and design Copyright© 2004 - 2019 , movieXclusive.com™ All Rights Reserved.